Elon Musk likes to keep himself busy. As CEO of Tesla, SpaceX, Neuralink and Hyperloop, he’s overseeing everything from launching a 12,000-satellite broadband network to building a NYC-to-DC hyperloop to installing computers in our brains. But with Tesla struggling to hit its production numbers for the new Tesla Model 3, Musk has stepped in place of his senior vice president of engineering to directly oversee manufacturing at the factory. Musk had previously tweeted that Tesla would hit 20,000 Model 3 cars manufactured per month by December of last year. 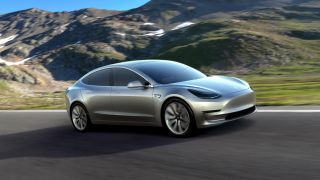 He later amended his prediction, stating that by the end of 2018’s spring quarter, Tesla would produce 500 Model 3s per day, or 2,500 per week. After Jalopink exposed a company memo from Musk stating that the company could now make 2,000 cars per week, and The Information revealed that Musk had taken control of manufacturing, Musk responded angrily on Twitter, but didn’t contradict the claims. Last week, VP Doug Field sent a memo to employees announcing Tesla would reallocate employees to focus on Model 3 production, Bloomberg reported. He called the industry experts who doubted Tesla’s ability to hit their manufacturing goals “a bunch of haters” and urged employees to work hard to hit the 300-car-per-day milestone. Tesla’s numbers did rise significantly that week, but Field’s petition to may have been too little, too late for Musk. Now Musk is sleeping at Tesla’s Gigafactory in Nevada, hoping to ensure Tesla hits its benchmark of 5,000 Model 3s per week by the end of June. In response to this news, Tesla issued a press release with manufacturing numbers for spring 2018. In the past seven days Tesla made 2,020 Model 3 cars, out of 8,180 total for 2018. For comparison, Telsa also produced 11,730 Model S cars and 10,070 Model X cars this spring, totalling almost 30,000 vehicles. If Tesla reaches its goal of producing 5,000 per week for the Model 3, then producing 30,000 cars would only take a month and a half. And that wouldn’t even include the Model S and X cars being produced at the same time. Next week, Tesla reportedly plans to produce 2,000 Model 3s and 2,000 Model S and X cars within seven days. Despite not hitting their Q1 goals, Tesla’s release insists the company is “on track” to hit their production numbers for the 3, S and X in 2018. This news is just the latest in a series of negative press Tesla and Musk have dealt with in the past week. After Tesla discovered a steering defect in the Model S cars, the company voluntarily recalled 123,000 Model S models for garage repairs. Thankfully, no accidents have been associated with this defect. But Tesla’s Autopilot is implicated in a fatal Model X crash currently being reviewed by the National Transportation Safety Board (NTSB). Tesla said in a statement that Autopilot gave the driver “several visual and one audible hands-on warning” to avoid the crash, but that the driver did not take action. All Tesla Model 3 cars have Autopilot enabled, and Tesla said Model 3 drivers are “3.7 times less likely to be involved in a fatal accident” using Autopilot than when driving themselves. But the NTSB is reportedly “unhappy” that Tesla released confidential investigative knowledge to the public before the agency could issue its own preliminary report on Autopilot. In a tweet yesterday, Musk defended the decision to discuss the accident, saying Tesla has an obligation to “public safety”. With all of these legal distractions and weekly SpaceX launches, will Musk be able to spur on Model 3 manufacturing time? It remains to be seen how Musk will streamline manufacturing directly, though the recent numbers are encouraging for Tesla. We'll have to wait and see if Musk has any tech solutions up his sleeve.